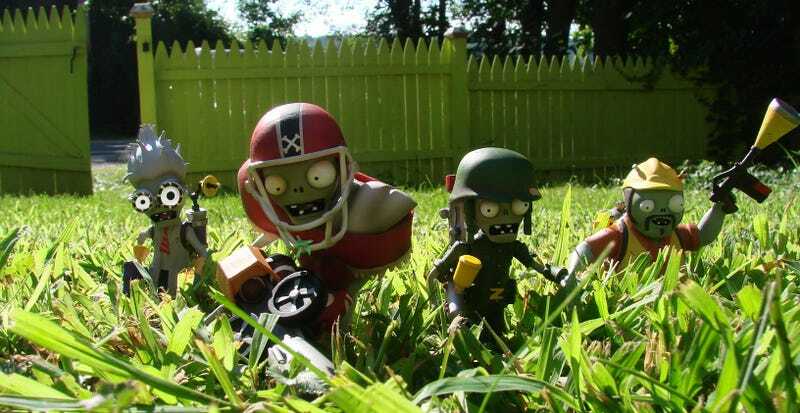 EA's casual game turned online multiplayer shooter arrives on PlayStations today, making it the perfect day for Diamond Select Toys and Popcap to announce a line of Garden Warfare action figures, coming soon to a lawn near you. When I first saw the announcement this morning, I figured Diamond Select was just talking about Garden Warfare Minimates, one pack of which will be available at Toys'R'Us stores in early September, the other at specialty comic shops. After years of deliberation, I've decided I'm not a huge fan of Minimates, and therefor was a little but bummed. But lo and behold, behind those blocky little bastards there was beauty. Available next month wherever Diamond Select Toys are sold, these "Bloom and Doom" 5-inch scale figure two-packs are the perfect way to appeciate the art style of Garden Warfare without getting shot in the process (though depending on your neighborhood that's not completely ruled out). A lovely assortment, and if these sell well enough there's are still some 80 bajillion character variants to release. I won't rest until I get a Marine Biologist with Dolphin Gun.